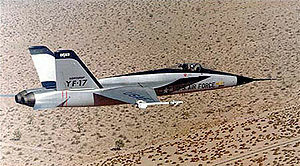 Picture - YF-17 in flight over the desert. The Northrop YF-17 (nicknamed "Cobra") was a prototype lightweight fighter aircraft designed for the United States Air Force's Lightweight Fighter (LWF) technology evaluation program. The LWF was created because many in the fighter community believed that aircraft like the F-15 Eagle were too large and expensive for many combat roles. The YF-17 was the culmination of a long line of Northrop designs, beginning with the N-102 Fang in 1956, continuing through the F-5 family. Although it lost the LWF competition to the F-16, the YF-17 was selected for the new VFAX specification. 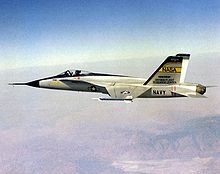 In enlarged form, the F/A-18 Hornet was adopted by the United States Navy and United States Marine Corps to replace the A-7 Corsair II and F-4 Phantom II, complementing the more expensive F-14 Tomcat. This design, conceived as a small and lightweight fighter, was scaled up to the F/A-18E/F Super Hornet, which is similar in size to the original F-15. The aircraft's main design elements date to early 1965, from the internal Northrop project N-300. The N-300 was itself derived from the F-5E, and features a longer fuselage, small leading-edge root extensions (LERX), and more powerful GE15-J1A1 turbojets, rated at 9,000lbf (40kN) each. The wing was moved higher on the fuselage to increase ordnance flexibility. The N-300 further evolved into the P-530 Cobra, utilizing 13,000lbf (58 kN) GE15-J1A5 engines, with a very small .25 bypass ratio leading to the nickname "leaky turbojet". The bypass effectively was only a cooling stream for the rear of the engine, allowing the engine bay to be constructed of lighter, cheaper materials. The P-530's wing planform and nose section was similar to the F-5, with a trapezoidal shape formed by a sweep of 20� at the quarter-chord line, and an unswept trailing edge, but was over double the area, with 400sqft (37 m) as opposed to the 186 of the F-5E. Initially shoulder mounted, the wings were gradually shifted down to the mid position. Its most distinctive new feature were the LERXs, that tapered into the fuselage under the cockpit. They enabled maneuvering at angles of attack exceeding 50�, by providing about 50% additional lift. The extensions also trapped airflow under them at high angles of attack, ensuring airflow into the engines. The resemblance to the head of a cobra lead to the adoption of the nickname "Cobra", often unofficially used for the YF-17. 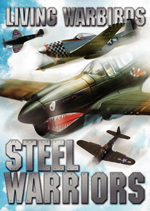 Studies showed a single vertical stabilizer was insufficient at high angles of attack, and it was changed to twin vertical stabilizers, canted at 45�. 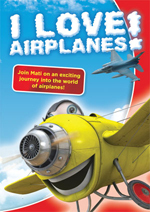 The result was an aircraft that had relaxed longitudinal stability, enhancing maneuverability. Northrop was not yet confident in fly-by-wire controls and retained mechanically signaled flight controls. The resulting aircraft, unveiled on 28 January 1971, advertised a max weight of 40,000lb (18,144kg) and maximum speed of Mach2, but stirred little interest among foreign buyers. The YF-17 was primarily constructed of aluminum, in conventional semi-monocoque stressed-skin construction, though over 900lb (408kg) of its structure were graphite/epoxy composite. The small nose contained a simple ranging radar. The cockpit sported an ejection seat inclined at 18�, a bubble canopy, and a Head-Up Display (HUD). The thin wings carried no fuel, and in areas such as the leading and trailing edge and the LERX, were composed of a Nomex honeycomb core with composite facesheets. The rear of the aircraft sported twin all-moving stabilators of aluminum over a honeycomb core, and twin vertical stabilizers of a conventional construction. Like the wings, the leading and trailing edges were constructed of composite facesheets over honeycomb core. A composite speedbrake was located above and between the engines. The aircraft was powered by a pair of 14,400lbf (64 kN) General Electric YJ101-GE-100 turbofans, a development of the GE15, mounted next to each other to minimize thrust asymmetry in the event of an engine loss. For ease of maintenance, the engines are mounted in a steady-rest that allows removal from below the aircraft, without disturbing the empennage controls. Each engine drove an independent hydraulic system. 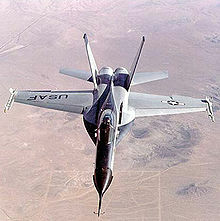 Unlike the P-530, the YF-17 sported a partial fly-by-wire control scheme, formally called the electronic control augmentation system (ECAS), utilizing ailerons, rudders, and stabilators for primary flight control. When the Lightweight Fighter program was announced in 1971, Northrop modified the P-530 into the P-600 design that would be designated the YF-17A. Whereas the P-530 was intended as a multi-role aircraft, the P-600 was to be strictly an air-to-air demonstrator, and consequently the cannon moved from the underside of the fuselage, to the upper part. Design of the YF-17 and the prototype YJ101 engine (a development of the GE15 engine), consumed over a million man-hours, and 5,000 hours of wind tunnel testing. The first prototype (tail number 72-1569) was rolled out at Hawthorne on 4 April 1974, and made its first flight at Edwards AFB on 9 June. The second YF-17 (72-1570) first flew on 21 August. 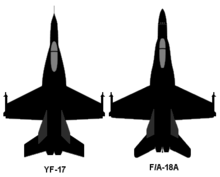 Through 1974, the YF-17 competed against the General Dynamics YF-16. 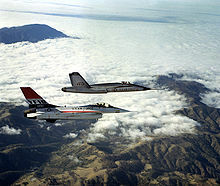 The two YF-17 prototypes flew 288 test flights, totaling 345.5 hours. The YF-17 attained a top speed of Mach1.95, a peak load factor of 9.4 g, and a maximum altitude of over 50,000ft (15,000 m). 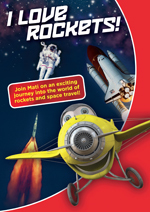 It could attain a sustained 34� angle of attack in level flight, and 63� in a climb at 50kt (58mph, 93km/h). The U.S. Navy was a small participant on the LWF program. In August 1974, Congress directed the Navy to make maximum use of the technology and hardware of the LWF for its new lightweight strike fighter, the VFAX. As neither contractor had experience with naval fighters, they sought partners to provide that expertise. General Dynamics teamed with LTV Aerospace for the F-16N; Northrop with McDonnell Douglas for the F-18. Each submitted revised designs in line with the Navy needs for a long-range radar and multirole capabilities. Prototype YF-17 72-1569 was sent to NASA's Dryden Research Center for base drag studies from 27 May to 14 July 1976 prior to the first F/A-18 prototype under development. Prototype 1 is at the Western Museum of Flight in Torrance, California. Prototype 2 is at Battleship Memorial Park in Mobile, Alabama. Miller, Jay. McDonnell Douglas F/A-18 Hornet (Aerofax Mingraph 25). Arlington, Texas: Aerofax, Inc., 1986. 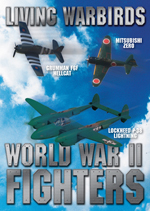 ISBN 0-942546-39-6.